City Honors film students and STARS students recently created weekly videos during April's Autism Awareness Month. The video clips were played in homeroom classrooms for all students to view. The videos included students and outside resources to provide a better understanding of those on the autism spectrum. Inside a City Honors high school class for students with autism. “I was diagnosed with severe low-functioning autism,” Alex Rivera, junior at City Honors, explained. Rivera started at the school in fifth grade after transitioning into the city school system from Summit Learning. Rivera had no verbal skills until the age of five. Alex Rivera, junior at City Honors, with is mom Ann Rivera. “We had to use sign language back then and now I’m high-functioning autistic," Rivera said. "I was also diagnosed with Pervasive Developmental Disorder – that’s gone now, and I am now an Asperger and I have ADHG and some other things as well." “One of the things we noticed, when he came to City Honors in fifth grade, is suddenly he started performing at a much better level academically and he’s made progress every year since then,” said Ann Rivera, Alex's mother. WBFO asked her what she believes helped her son improve his academics. “They knew how to support him in the classroom. It was the right kind of setting for him. They knew how to work with him. The support him in a variety of ways both socially and emotionally and academically. Once you gave him the supports he needed, he could since in a way that he deserves to,” replied Rivera. Rivera is among 85 students at City Honors in the STARS program. It was first launched in 2005. The same year Bill Kresse arrived as principal when there were fewer special education students attending the school. City Honors Principal Bill Kresse in his school office. “We were really surprised that there were not more students with special needs at this building and we had to figure out a way to attend to that. How the district and the Office of Civil Rights had devised systems to place students at the school was understandable. They wanted to arrive at standardization to build community confidence and to assure everyone that students were being placed by a system rather than individual people,” Kresse explained. The program for autism has now grown to 12 home-based classrooms. “We cluster students with similar special needs – in this case autism and Asperger’s – in the same location which gives us an opportunity to look for teachers who have specialized background in working with students with autism. It gives us the opportunity to look for duel-certified teachers, so that the teachers in front of these students have the same qualifications that there Gen-Ed counterparts have and it also gives us an opportunity to add a therapeutic component for the students that’s specific to their needs,” Kresse remarked. Kresse tells us it's a formula that works and there is proof the programs is succeeding. In the last four years, 16 of 19 students earned full regents diplomas. The other students graduated with a local diploma. “And this is something that 20 years ago, because of how these students physically and verbally manifest themselves, would have been assumed there’s no way they could compete for a Regents diploma, but if you set it up the right way, they can do it – there’s no doubt about it,” Kresse replied. Brittany Gillotti & Maria Coats teach high school in the City Honors STARS Program. A team of teachers who specialize in autism work with students, placing them together in small groups. “You know with autism – understanding the social skills and the social goals, so it is kind of balancing that in my classroom,” said Brittany Gillotti, high school social student’s teacher in the STARS program. “All of my students are on the autism spectrum in some way,” explained Maria Coats, high school science teacher in the STARS Program. “They’ve all been different and they’ve all grown in their own, but I think a lot of them – just even like seeing my seniors – you know when the start in ninth grade, sometimes we’re not sure are they going to be able to reach that diploma, and so far we’ve had all our students either be able to get a local diploma or a regents diploma – that’s been a big positive for me – is just being able to see our students graduate with a diploma – prepared for something, whether it’s college or a job,” said Coats. WBFO asked the teachers what the challenges the face in the classroom. “To make sure that I meet their needs and that I’m working at their level and reflecting every day to make sure that I have done that in a way so they can be successful on the regents exam in June. If I don’t do that, then I am worried about their success, their graduation because it all – even in their freshman year goes back to that,” Gillotti remarked. Parent Karema Rogers describing her son Jace, fifth grader at City Honors who is also the autism spectrum. “He’s a little bit what you call that quirky kid – a little bit awkward. The best way I can explain him is Sheldon from Big Bang Theory,” Rogers laughed. Karema Rogers & her son Jace. The family relocated last year from Manhattan. Rogers said her son was initially lost in the public school system then sent to a private school in New Jersey with two-hour commute. “It was just so far away. I couldn’t get to him. I couldn’t get to parent-teacher conferences. I couldn’t be active. This school – I came here and I didn’t know what I expected, but I expected them to throw him a classroom and just kind of forget about him and I spoke to his teacher when he first started and I said ‘do you understand why he is here?’ and she said ‘I totally get him’ and she said this is the perfect place for him,” Rogers recalled. “We learn about the math and science that I don’t know about,” said Jace Rogers. Jace tells us his favorite subject is science & technology. “Be more social and learn more and sometimes we have fun,” declared Rogers. Rogers tells us the school has been "amazing" in guiding her son in the classroom. Autism Services is making a push to increase acceptance and awareness. The organization held an art exhibit in WNED|WBFO’s Horizons Gallery. The exhibit also featured performances by the Autism Services band No Words Spoken. WBFO's Senior Reporter Eileen Buckley says Autism Services' annual art show displays work from artists with autism. 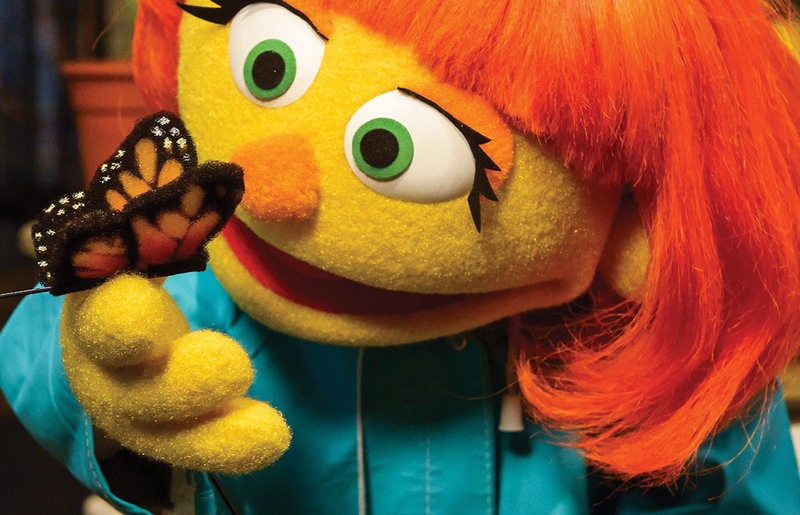 A brand new Muppet will debut next month on Sesame Street. The new character is Julia, who has autism. WBFO's Senior Reporter Eileen Buckley says our region's Autism Services is very excited about the character. WBFO's Senior Reporter Eileen Buckley says our regions Autism Services is very excited about the new Muppet.